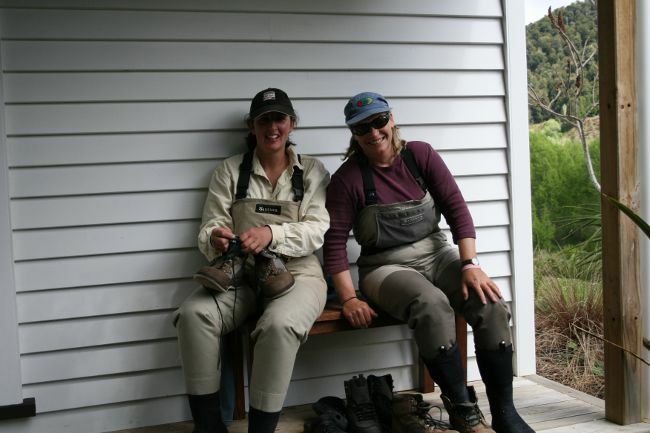 Fly fishing in the South Island of New Zealand is mostly about fishing to sighted fish. As a result, you don’t need to be able to cast the entire fly line. Indeed, 25 to 40 feet is the average distance we fish. We recommend a 5 or 6 weight rod; the action should suit your casting style. Your rod should be paired with a wide arbour reel equipped with a good drag system — this is vital as it aids you in landing your fish of a lifetime! The fly line should be a dull/dark-coloured floating weight forward line, paired with a 12-15 foot leader (yes, that long!). 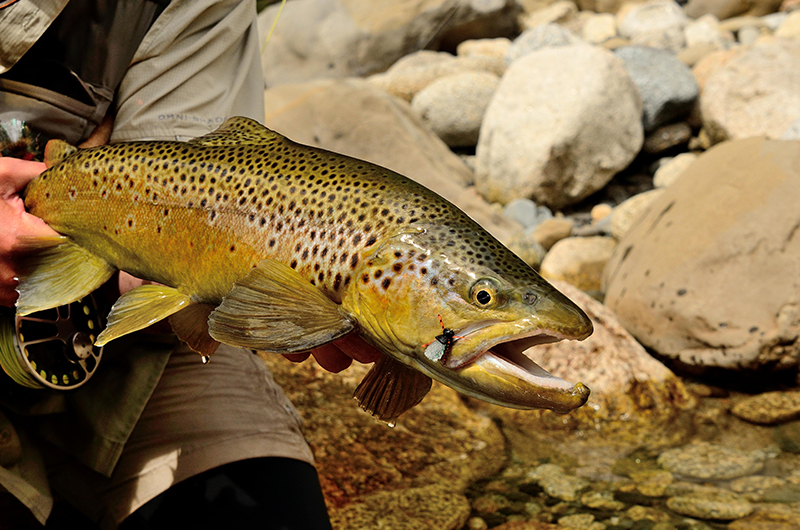 Combine this with 4, 5 or 6 lb tippet — we recommend RIO. Owen River Lodge is an authorised Sage dealer and has almost the entire Sage line-up of rods and reels for you to try and use, all included in our tariff. We recommend you call/email us before you arrive, just to make sure we have the gear available in your size. Please use the following as a check list of gear to bring. 5-6 weight is ideal. If you have both, bring them along. That way, you can have the 5 weight rigged as a dry fly rod and the 6 weight rigged for nymphing. To suit your rod, make sure your reel has a really good drag system and at least 50 metres of backing. Due to the clarity of the rivers we fish, long leaders are essential: 12 > 15 foot, 8lb (3x) tapered leaders are ideal. Most anglers use a weight forward, floating line. Dull in colour, green being ideal. 4, 5 and 6 pound fluorocarbon/nylon. We use Rio and Umpqua. With floatant, clippers and forceps (the best tool for removing flies from the large trout you are going to catch). A good-quality, hooded rain jacket. Dull colours are best. Gore-Tex type is best for early/late season. In the warmer months, most Kiwis wade wet. All you need is a pair of lightweight nylon shorts over polypropylene underwear bottoms and your boots. An even better product than polypropylene, is Kiwi Merino wool thermal underwear leggings/bottoms. We never leave home without them! Nylon, cargo-style hiking pants also work well. Good-quality polarised sun or prescription glasses, woollen socks, a wide-brimmed hat or baseball cap and windproof pullovers/fleeces. 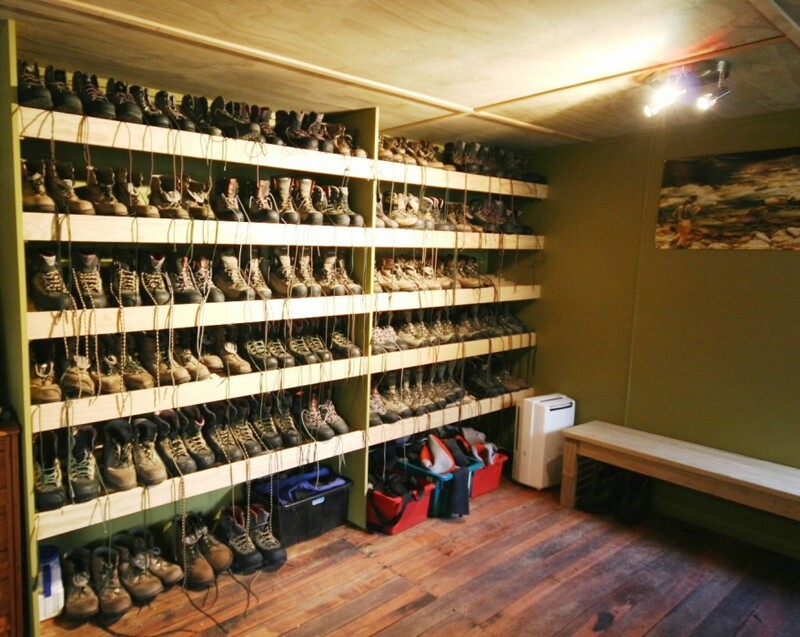 The lodge has a good selection of flies, tippet material, leaders, fly lines, polarised sun glasses, fishing shirts, pants and wading jackets for sale. 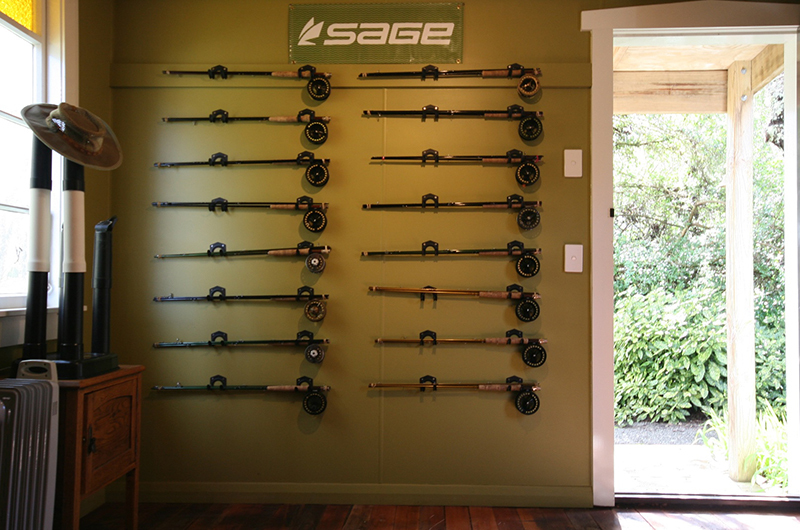 As an authorised Sage Dealer, we stock and sell Sage rods and reels. 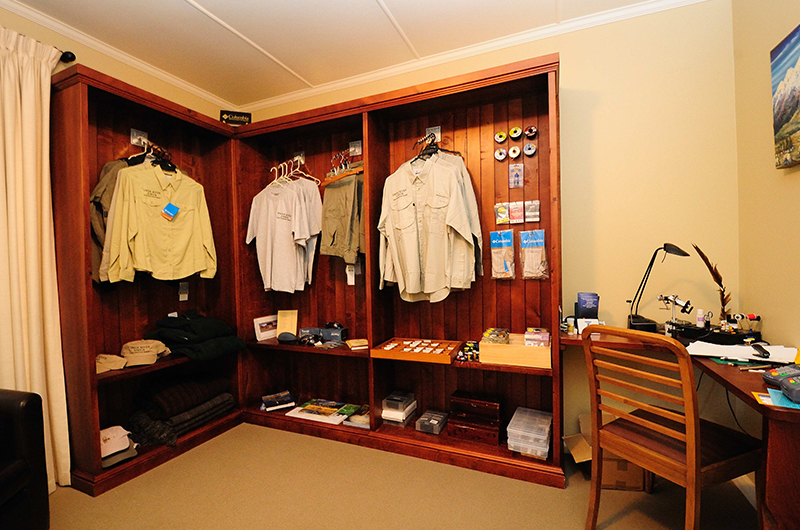 The lodge has a selection of premium fly fishing equipment for our guests to use free of charge. 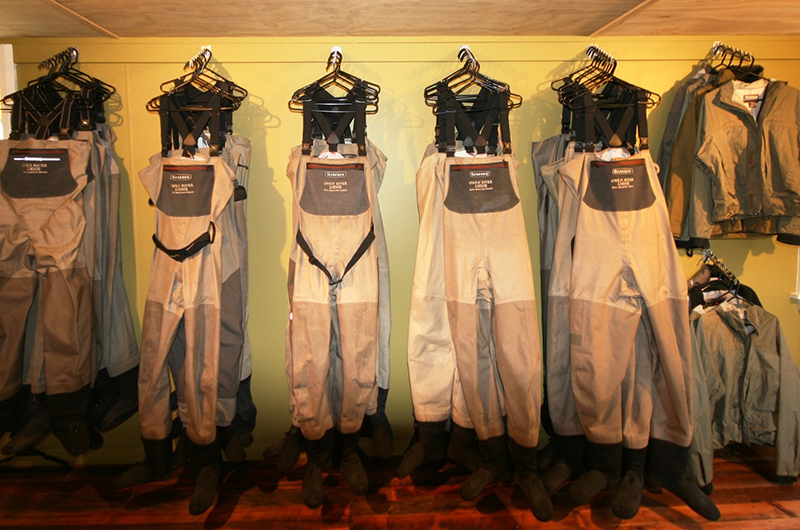 Simms GuideG3 and Guide Stocking foot Gore-Tex waders, sizes from small ladies to men’s XXL! Sage X, Igniter, One, Method, Accel & Mod 6 weight rods all with Sage Spectrum LT reels. Parachute Adams, Standard Adams, Blow Fly, General Terrestrial and Cicadas. Hare and Copper, Pheasant Tail, and some small tungsten bead heads (size 12-18).